2. Wash asparagus well, but gently, under running water. Cut stems from the bottom to leave spears with tips that fit into the canning jar with a little less than ½-inch headspace. 3. Peel and wash garlic cloves. Place a garlic clove at the bottom of each jar, and tightly pack asparagus into jars with the blunt ends down. 4. In an 8-quart Dutch oven or saucepot, combine water, vinegar, hot peppers (optional), salt and dill seed. Bring to a boil. Place one hot pepper (if used) in each jar over asparagus spears. Pour boiling hot pickling brine over spears, leaving ½-inch headspace. 5. Remove air bubbles and adjust headspace if needed. Wipe rims of jars with a dampened, clean paper towel; apply two-piece metal canning lids. 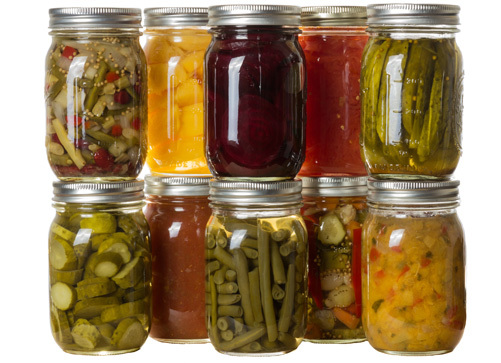 Allow pickled asparagus to sit in processed jars for 3 to 5 days before consumption for best flavor development.